I recently read a book called, Minding My Mitochondria by Dr. Terry Wahls, clinical professor of Internal Medicine at the University of Iowa and the Veteran’s Administration Hospital in Iowa City. I’ve written about her before, but have to re-visit the topic again. It’s pretty AMAZING to read how a change in diet and shock therapy have allowed her to walk and ride her bike 10 miles daily after six years in a wheelchair!! There is something very profound to be learned from her! In her daily practice with patients she now focuses on "malnourished mitochondria" and using our food to heal the body. She includes one of my favorite quotes in her book, “Hippocrates, the ancient Greek physician whose oath I took in 1982, said ‘Let good, wholesome food be thy medicine.’ I don’t remember ever being told that during medical school. But now I see the wisdom.” She explains in the book that energy from food is converted from mitochondria. Mitochondria also metabolize or "detoxify" the poisons that get into our blood, along with numerous other primary roles in the body. Mitochondrial health is linked to chronic disease: depression, diabetes, obesity, high cholesterol levels, arthritis, asthma, heart disease, coronary artery disease, M.S. and other autoimmune diseases. In essence, we are lacking the micronutrients needed for our cells to function well. She suggests increasing the amount of non-starchy veggies & fruits eaten and reducing sugar and carbs. “Eating the standard American diet, which is high in carbs, revs up 65 genes that drive chronic disease or eating a diet high in green leaves, whole fruit and protein, turns on 72 genes to down-regulate the inflammation molecules.” Diets high in grains, carbs and sugars also affect the types of bacteria that can thrive in our guts, which prevents the removal of toxins & proper function as well as inflammation in the body. Ironically, three weeks ago I heard the same information from Dr. Jocelyn Zentz, N.D. as we discussed test results for a food sensitivity test I took. I’ve already made a big change in the amount of vegetables that I eat from the brassica family (many great recipes can be found in the Brassy Brassica section of my blog). But I’ve now come to learn that was only half of the equation. Most likely some of the fatigue, hormone imbalance, tingling in my left hand and arm, to name a few, may be due to an imbalance of yeast or the bacteria in my gut. I’ve read several articles, and there are two sides to every coin. But I’ve decided it doesn’t hurt to try and see if there are positive results. As my family practice doctor recently told me, “You are a pioneer in many ways when it comes to these types of things. If it doesn’t work then there are other options to explore.” I don’t eat many desserts, bread or crackers as I could tell that it impacted my body in many ways. But sugar was still finding its way into my body. As a work around to Skoogie’s egg and peanut allergies, sugar and carb-laden breakfasts like granola, cereals, pancakes/waffles became more prevalent. After giving up coffee seven years ago, I began enjoying a daily cup of sweet chai every morning and I often have a glass of wine with dinner—both are high in sugar which feeds yeast. I’m in my second week of this new change and things are going pretty well. I deeply miss my morning chai and am experimenting with black tea mixed with chai from a tea bag and frothed soy milk, but haven’t quite found the right combination yet. I often feel hungry, but from what I understand, the body is craving what is no longer there… and this too shall pass. Earlier today I even thought to myself, I don’t have the tingling in my hand. Although the tingling did return after eating pineapple, which I have to watch and explore further. I’ll continue to keep notes and will share along the way. So far one of the hardest changes has been not cooking without vinegar while I temporarily remove it… but lemons are my new best cooking friend, providing the acid and twang that vinegar bring to a dish. I’m still trying to re-work my Apple Kale Salad, but that will come! 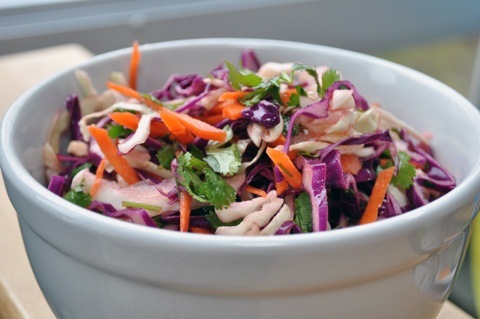 In the mean time, try this citrus-based slaw. If you are interested in Dr. Terry Wahl’s work, you can view videos of one of her talks at: http://www.youtube.com/watch?v=bEikq4x5Abc., there are six parts. Submitted by 1GirlGreen on Tue, 05/03/2011 - 16:33. I admire your determination and patience to get to the bottom of why you are not feeling your best self. I love that quote from Hippocrates! This whole idea of finding the food that best feeds your body is terriblty intriguing and provides SO MUCH PROMISE of better health for us Westerners. Thanks for sharing your journey!